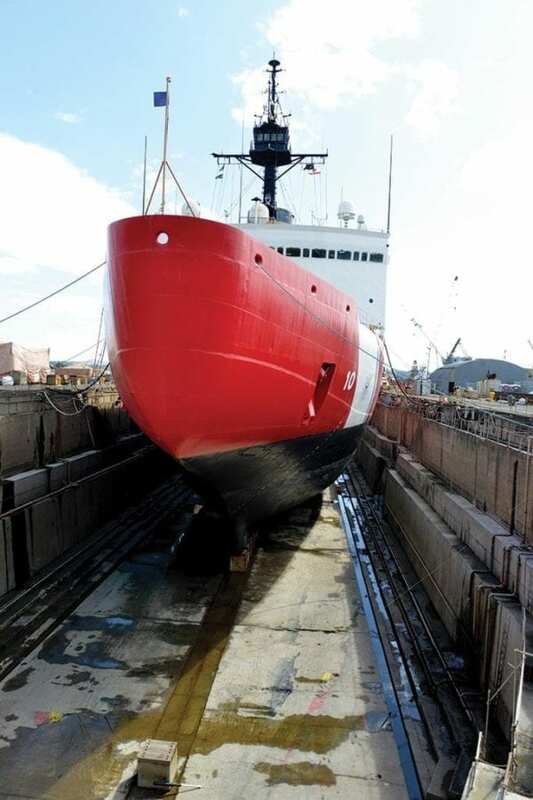 The Coast Guard’s polar security cutter (PSC) program wants to make it clear: The ship is more than an icebreaker – it is a multi-mission cutter. While the special polar-class design will give it the capability to work in and around ice and carry out the ice breaking function in both the Arctic and Antarctic, it must also support all mission areas across a spectrum of environmental conditions. So why do we need to be operating in the extreme latitudes? America is an Arctic nation, and has long held interests in operating in both polar regions. There are existing ice-capable ships for research and commercial purposes. But the ability to carry out law enforcement and defense missions makes this cutter much more than what is currently available today. The Coast Guard’s operational polar ice breaking fleet currently includes one 399-foot heavy icebreaker, CGC Polar Star (WAGB 10), which was commissioned in 1976; and one 420-foot medium icebreaker, CGC Healy (WAGB 20), commissioned in 2000. A second heavy icebreaker, Polar Sea (WAGB 11), is currently out of service and is being used for parts to keep Polar Star operational. The other U.S.-flagged icebreakers are the R/V Sikuliaq, R/V Nathaniel B. Palmer, R/V Laurence M. Gould, and the offshore supply ship Aiviq. The 261-foot, 3,700-ton research vessel R/V Sikuliaq is owned by the National Science Foundation (NSF) and operated by the College of Fisheries and Ocean Sciences at the University of Alaska Fairbanks. The 6,200-ton, 308-foot ice-capable research ship R/V Nathaniel B. Palmer is owned by Offshore Service Vessels LLC, operated by Edison Chouest Offshore, Inc., and supports the National Science Foundation’s work in the Antarctic. It was built in 1992. The 230-foot, 3,000-ton R/V Laurence M. Gould was launched in 1997, and is also operated by Edison Chouest Offshore, Inc., to support the NSF Antarctic research program. The 360-foot, 4,200-ton Aiviq is an ice breaking anchor handling tug supply (AHTS) vessel owned by Edison Chouest Offshore and was built to support oil exploration and drilling in the Chukchi Sea off Alaska. While these ships are ice capable, none are built to break more than 3 feet of ice, and none are capable of carrying out the full range of Coast Guard missions. So why do we need to be operating in the extreme latitudes? America is an Arctic nation, and has long held interests in operating in both polar regions. But the environment is changing, and the result is less multi-year ice and more open water. The diminishing ice environment is an incentive for increased human activity. But while there is less sea ice in the summer months, it still covers most of the Arctic on at least a seasonal basis.